Fee (late of Manor Drive, Lurgan and formerly of Blaney, Enniskillen), February 11, 2019 peacefully at Aughnacloy House. Sarah (Sadie), beloved wife of the late James Patrick and loving mother of Sheila, Maria, Kevin and the late James and Eileen, a much loved grandmother and great grandmother. Funeral from her daughter Sheila's residence, 104 Ardowen, Craigavon on Wednesday at 9.30am to St Paul's Church for 10.00am Requiem Mass. Burial afterwards in the Holy Trinity Cemetery, Lisburn. House Strictly private, everyone welcome to the funeral service. Sadly missed by her daughters, son, grandchildren, great grandchildren and entire family circle. 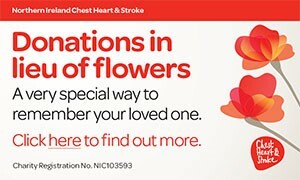 Family flowers only please with donations in lieu if desired to, Aughnacloy House Residents Comfort Fund, c/o McAlinden & Murtagh Funeral Directors, 5 William Street, Lurgan. Telephone: 02838 324404. I am sorry to tell you that Sarah (Sadie) FEE has passed away.